Equinox is a company of professional barber tools which is based in USA and which is supplying the highest quality tools for barbers and beauty salons. Offering many varieties of professional hair cutting shears, razors, razor blades and other similar products, nowadays Equinox has become one of the most superior names in the Barber and Salon industry. Equinox hair shears are made of Japanese stainless steel which is known as high quality material, ensuring this product’s lifetime warranty which is provided by manufacturer. These barber shears have razor edge hollow ground blades which offer razor-sharp cutting, guaranteeing smooth and precise cuts. Their razor edge blades are made from high grade steel, constantly giving the same razor-sharp cuts since first use. These Equinox haircut scissors are 6.0 inches long, but their razor edge blades are 3.0 inches long. These shears have no possibility to adjust the tension, but they have other useful features, for example, removable finger rest and removable finger inserts. If you do not need finger rest or it is disturbing you, you can simply remove it. Removable finger inserts ensure possibility of size adjustment, namely, if your thumb is too small or too big for these shears, just insert or remove these rubber inserts. It should be mentioned, that these shears come with metal disc which is intended for tightening of scissors, if they become too loose. These hairdresser shears are silver color with mirror polish which gives them shiny and elegant look. This set includes two pairs of rubber finger inserts – blue and pink, therefore, you can choose the one which you like the most. There are Equinox name and logo on the blade. With these razor-sharp hair cutting shears you can realize various hair cutting techniques, for example, slice, ship, point and blunt, forming perfect cut. 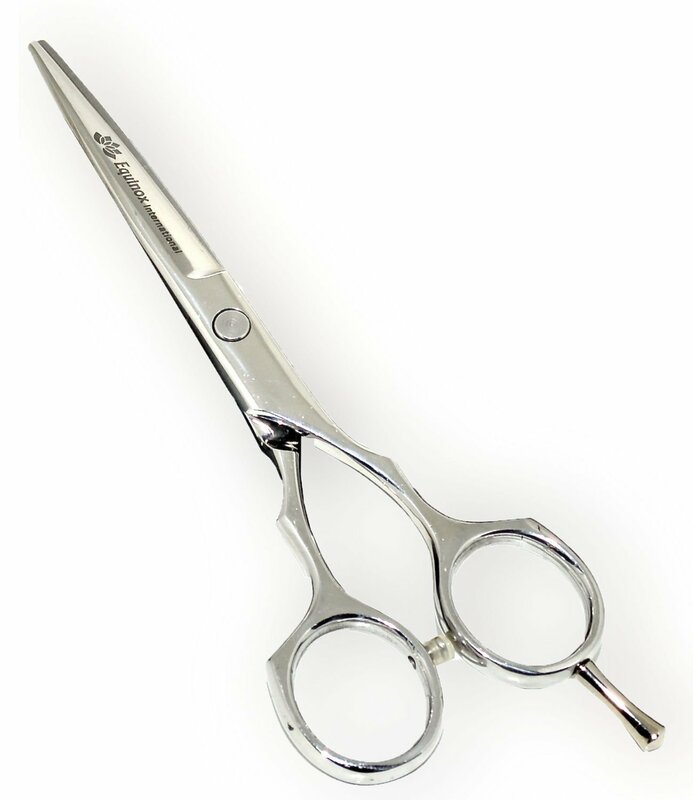 As these Equinox shears are popular among professional barbers and their price is acceptable, they are suitable both for professionals and students. These Equinox Barber & Salon Hair Cutting Scissors are intended for hair cutting. They are made of highest quality Japanese stainless steel, providing longevity and long-lasting usage, therefore Equinox offers lifetime warranty for this product. Total length of these hairdresser shears is 6 inches, but their razor edge hollow ground blades are 3 inches long. They are silver color with mirror polish. Despite the fact that there is no possibility to adjust their tension, they have other features for comfortable usage, for example, removable rubber finger inserts and removable ringer rest, as well as metal disc for tightening of scissors. With these Equinox hair cutting scissors both professionals and students will be able to cut hair, using different techniques.